Tushar Chopra is an Assistant Professor of Medicine at the University of Virginia who is dedicated to patient-centered care, lifelong learning, and developing innovative tools as a renal educator. In sports, there is no permanent victory or defeat, but there is a permanent attitude that ensures triumph in the end. I am excited to be a part of NephMadness this year, and we have strong contenders for the Filtered Four. 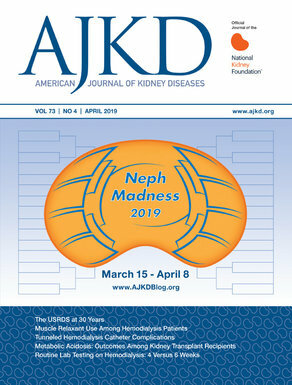 Volume management in patients with chronic dialysis is evolving with new tools and quality metrics to “probe the dry weight.” Inadequate removal and excessive removal of fluid from a patient are both associated with detrimental outcomes. This debate has led to the development of ultrafiltration rate (UFR) as a quality metric, which reflects interdialytic weight gain (IDWG) over a period of time. Three observational studies have demonstrated an association between greater UFR and mortality; the mortality risk rises markedly above 10-13 ml/kg/hr. Nephrologists get complacent about associations and strive for UFR of 10-13 ml/kg/hr, but in reality, patient symptoms limit the amount of fluid removed (e.g., cramping). Data correlating UFR and patient symptoms (e.g., post-dialysis fatigue) are lacking, which is an important research gap. Nevertheless, optimization of volume status is essential, but difficult to achieve without combining different tools to assess volume. Traditionally, most clinicians rely on “Old School” tools, such as history and physical exam (with pedal edema, jugular venous distension, and lung and cardiovascular examinations), pre-dialysis blood pressure, interdialytic weight gain, intradialytic hypotension, and “dry weight challenge,” to address volume overload in patients. However, limited physical exam findings such as pedal edema itself is not a reliable marker for detecting fluid overload, which can also be prevalent in patients with obesity or pulmonary hypertension. The absence of rales and jugular venous distension does not rule out volume overload. Blood pressure is a useful vital sign, but does not correlate well with extravascular volume. Relative plasma volume (RPV) monitoring helps to understand the rate of refill of the intravascular compartment, but, in a randomized controlled trial, patients on RPV monitoring experienced worse outcomes than patients on conventional monitoring. Indeed, old school techniques such as physical exam remain a key component of assessment, but “New School” techniques help us understand different body fluid compartments. Bioelectrical impedance (BIA) analysis relies on passing a low strength electric current through the body to measure tissue resistance as a determinant of total body water, extracellular volume, and body cell mass. Multi-frequency devices are predominant (whole body, segmental), while mono-frequency devices are of questionable value in dialysis patients. The Bioimpedance (resistance-reactance) vector length reflects the degree of tissue hydration, and the vector lengthens with ultrafiltration (lower body hydration). Shorter pre-dialysis bioimpedance vectors, indicating greater soft tissue hydration, are associated with diminished survival in hemodialysis patients, consistent with clinical observations linking longevity with the maintenance of dry weight. Although over-hydration detected by BIA on chronic dialysis is associated with worse outcomes, BIA is not yet established as a purposeful tool to guide ultrafiltration. Ultrasound technology helps us focus on different body fluid compartments. Inferior vena cava (IVC) ultrasound to assess IVC diameter and collapsibility is non-invasive and easy to perform. However, IVC diameter has a wide variability among healthy individuals, is unreliable in tricuspid valve disease, and requires multiple measurements for meaningful inferences. Extravascular lung water assessment can help us understand the circulating volume and the left ventricular filling pressure in patients at risk for volume overload. Lung ultrasound can evaluate sonographic B-lines that have been shown to correlate with the presence of extravascular lung volume, and rate of disappearance of B-lines have been utilized to assess dry-weight in patients on dialysis. The number of B-lines is associated with weight gained before dialysis as well as with extra weight after dialysis. An association between the decreases in B-lines with the ultrafiltration volume (e.g., a reduction in 2.7 B-lines for every 500 ml of fluid removed) has been verified by some, but not all subsequent studies. Patients with severe lung congestion (defined by the number of B-lines) had an approximately four-fold higher risk of death and an approximately three-fold higher risk of cardiac events compared with patients with mild or no congestion. Lung ultrasound is simple, feasible, easy to learn, and reproducible. Lung ultrasound holds promise and is currently being evaluated in a large randomized controlled trial with clinically relevant endpoints (hospitalizations, cardiovascular disease, and mortality). Innovation drives the unearthing of possibilities. As we develop more innovative tools to better understand body fluid compartments (e.g., thoracic ultrasound), we must also build capacity for education and dissemination of these tools. The knowledge, experience, and foresight imparted by educators can better equip professionals to face the challenges for the future. In conclusion, assessment of volume status in patients on chronic dialysis is difficult. There is not an easy-to-use, gold-standard method to determine extracellular fluid volume expansion. Various innovative, new, and upcoming tools are available to aid clinicians in determining whether the patient remains volume-overloaded after ultrafiltration. I support the use of New School tools to complement Old School tools to better manage volume in patients on chronic dialysis. New School for the slam dunk victory!